D-lux Burger is a very popular lunch/dinner spot at Disney Springs. The menu is simple, burgers, fries, milkshakes, a few chicken options, and a vegetarian burger. Seating here can be limited and lines can be long. Take advantage of mobile ordering at D-lux Burger. This way you can show up a few minutes early to try to stake out a good seat. We ate here in September on a 90 degree day. It was impossible to find indoor seating. This is a small location. On busy days (which is often because this is popular with locals and vacationers) the line will be out the door. Unfortunately, you will probably end up standing in the sun while waiting to get indoors to order. Another bonus to mobile ordering is the secret menu. This is a great way to give something a try that you normally wouldn’t. When ordering your food keep an eye out for seasonal items, milkshakes and a seasonal burger. They had a pumpkin pie milkshake that sounded awesome! What Did We Order at D-Lux Burger? Classic Cheeseburger- signature blend patty with cheddar, pickles, tomatoes, lettuce and grilled onions. For anyone that is from California this is going to sound a lot like an In and Out Cheeseburger. I’m going to be honest, it tasted really close to it but better. The burgers at D-lux Burgers are huge!!! The patty is very generous and the grilled onions were cooked perfectly. This was a solid choice for anyone who likes a good classic burger. Just like the name says!!! These burgers are really juicy so grab lots of napkins. 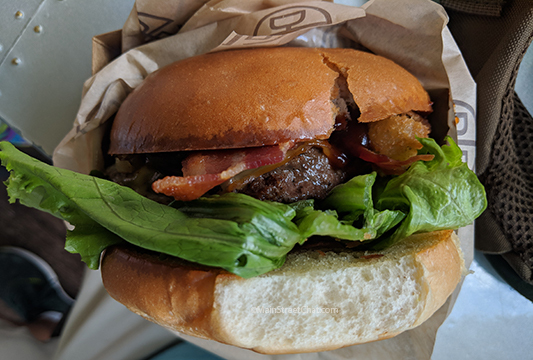 Barbeque Burger- This was very similar to the Classic Cheeseburger with the addition of an onion ring, Barbeque Sauce, Bacon, and Smoked Gouda. This is hands down the best BBQ burger that Adolfo has gotten at Walt Disney World. Kids Chicken Nuggets- Okay, so I may have stolen a piece of Kaitlyn’s Chicken so I could review it. Seriously though, this is the best Chicken Tender I have had on property. (We haven’t tried Chicken Guy yet but plan to soon). The breading was really light which is way different from a Disney Chicken Tender which has a lot of breading. The trick here is that they are using a donut coating to bread the chicken. Basket of French Fries – YUM!!!!!!!!!!!!!!!!!!! Fresh cut, thick fries with the skin still on. We really enjoyed the French fries. They had a nice crunch to them on the outside while still being soft. S’mores Milkshake- Honestly, we didn’t taste any marshmallow in this. Even so it was a really good high quality chocolate milkshake that we thoroughly enjoyed. Make sure to keep an eye out for the seasonal milkshakes. 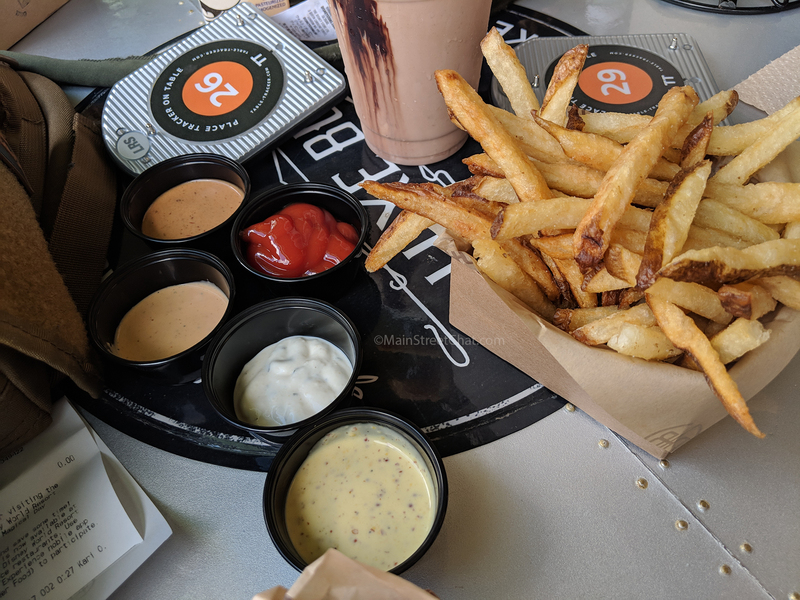 D-lux burger has several special dipping sauces for their chicken nuggets and French fries. We tried all of them. The majority of them we didn’t care for. For example the honey-mustard was not something that I would give to a young child. While I enjoyed it, I was the only one in our group. It had a very strong brown mustard flavor and wasn’t sweet despite being Honey Mustard. The one sauce that everyone in the group did like was the garlic ranch. While it didn’t really taste like ranch to us it was reminiscent of a garlic aioli. Still yummy. We weren’t planning on eating here and decided to swing by on our Disney Spring’s day. It was a busy and hot day so we tried camping out for a spot in the AC. Unfortunately, no one was in a hurry to leave so we ended up sitting outside on the Patio. It wasn’t bad really, there was a nice breeze and the whole Patio was shaded with fans going. The only things we found odd is that the food delivery was a little disjointed. We got our burgers and fries really fast but had to wait for our Milkshake. They do give you a pager to find you when you order your food but they take it away when you get your food. This leaves a lot of employees walking around looking for who ordered milkshakes. There were several employees going from table to table asking people what they ordered. We were half way through our meal when we got our milkshake. This wasn’t a big deal but something that we thought you should be aware of. 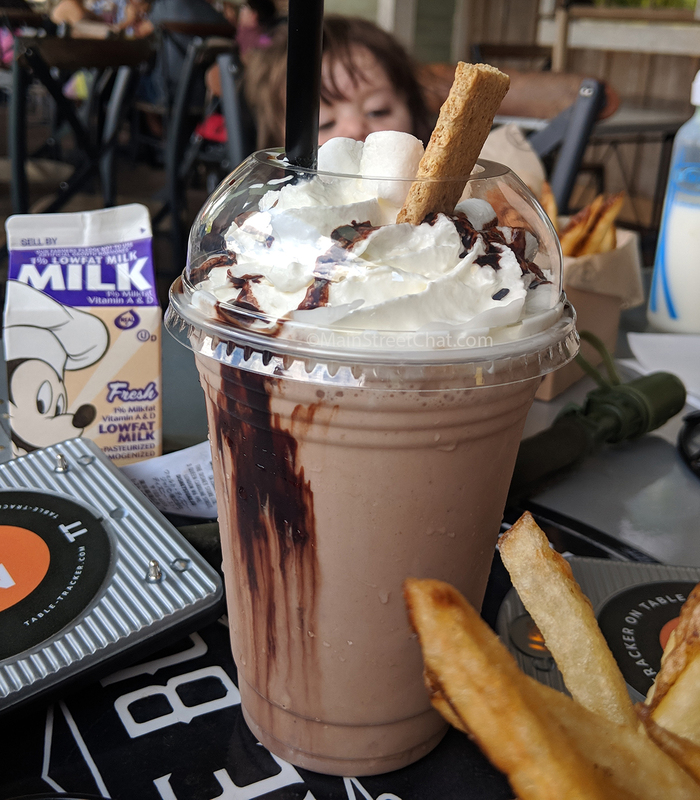 The milkshakes at D-lux Burger are very popular, so much so that if that’s all you want I would maybe recommend going to Ghiradelli instead so that it might be a little quicker. Would we eat at D-lux Burger again? Yes!! This was such a good meal we would gladly go back. I might not go back on a really hot day though. The building is small and most of the seating is on the Patio so that can be a real drawback during summer. To compare this to a national chain I would say that this is somewhere between a Five Guys and a Red Robin. If they had D-lux Burger in the Arizona Valley we would be regular patrons. Check our their full menu here. If you are interested in other Disney Springs Restaurants we have also eaten at The Polite Pig.